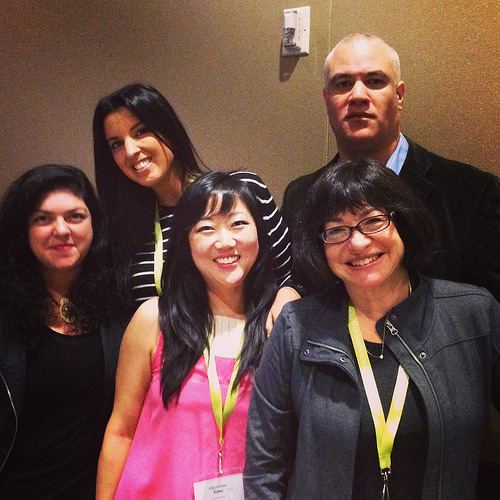 Last year, I wrote a panel proposal on writing outside of your race in fiction for the AWP Conference 2014. Writing characters of another race is a topic with which I have long been entrenched–since the days of being in an MFA program, and I was psyched when it was accepted. This an important topic that begs discussion, and is yet rarely discussed in open space. And I was thrilled to have an opportunity to discuss something so sensitive at AWP with some respected writing friends and mentors. 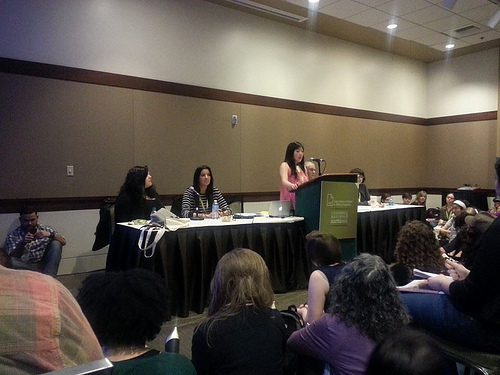 At AWP a couple months ago in Seattle, we (Randa Jarrar, Patricia Engel, Mat Johnson, Susan Ito, and I) had an amazing audience turnout for our panel entitled “How Far Imagination: Writing Characters Outside Your Own Race in Fiction”–people spilled out into the hallway in attendance, and sat on the floor all the way up to our feet. At 10:30am in the morning on the first day of the conference, no less. Needless to say, I was pleased with the reception. We had a very intense and enriching panel discussion, and then we segued into a Q&A that was largely audience-driven. I’m not sure in hindsight, as moderator, that I made the right call in calling first on a man who interrupted the panel mid-discussion. “I have a question!” a man called out in the middle of our discussion. I told him to hold off until our Q&A session. And so when our Q&A began, I felt obliged to call on him, first. Because I’m polite. And I’m a fairly competent moderator and I figured I could handle most conflict. Even though he is the kind of person who will interrupt a panel in mid-discussion because He Has A Really Important Question. I kind of regret calling on him first. But it at least opened the gates wide open on what is sensitive terrain. And we made some lively and important points on the panel, much thanks to our brilliant panelists. There are a couple reviews of our panel up on the web. There’s a brief one here. And if you want to read about our panel in detail (albeited biased detail), The Atlantic did a write up of AWP and gave a major shout out to our panel. I’m very delighted at the amount of real estate allotted to us, even if it did make panelist Randa Jarrar sound shrill and reactive, and the dude-with-a-question into a well-intentioned victim. But then again, I think you could write an entire article about the complexities of our panel topic and how they play out in the writing world. Ay Double You Pee On 84 Hours with 12 Hours of Sleep OMG my brain is melting how is this so much fun? Like to-may-toe, to-mah-toe. Except Ay Double You Pee is two seconds of my life I’ll never get back, everytime I say it (versus the monosyllabic awp). Also, it’s so much more fun to say it as “awp,” because you can have fun with words: AWPalachian, AWPful, AWPerator, AWPsidian, AWPbvious, AWPosition…I can’t stop. This does not work if you say it “ay double you pee.” Pee. Also, I don’t like to talk about urination. Just kidding: I like to talk about urination. Speaking of urination: the bathrooms at AWP were dangerous. I told a man that he was entering the woman’s bathroom (in a tone that says “Don’t you dare!”). He turned around. He was a woman. I had to stand behind her for ten minutes waiting for a stall (Oh! I’m sorry! Your hair is short! From the back–” ugh). Awkward. I obscured my conference name tag from view. In a separate bathroom line, I saw a woman slip in her boots on the wet marble floor of the restroom. She flew through the air in a dramatic face plant. Some of us asked her if she was okay. She sat splayed on the floor silent and stunned, surrounded by a circle of open jazz hands, like a musical dance number. Some of us continued to ask if she was okay. Others urged her to stand up. Some of us helped her stand up. I chose to tell her that we would not tell anyone about this incident. I just broke my promise. I think I broke my brain. It screamed every morning. I had a hangover even when I didn’t drink. Even after 1.25 cocktails (or is it 1.25 cocktail?). I knew hanging with Koreans would lead to drink. We hopped from bar to bar, closing one after the other: first car, second car, third car. 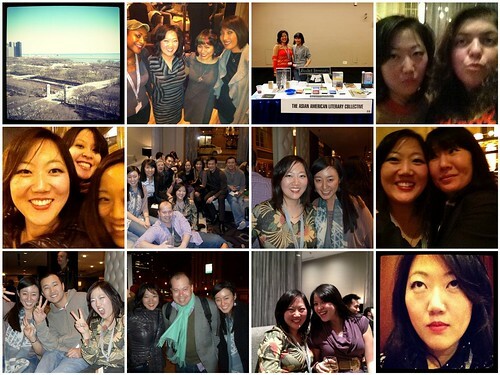 And I met more Korean American writers. I met K somewhere in the third car. (Later, I learned she and I had a mutual friend in Jamey). 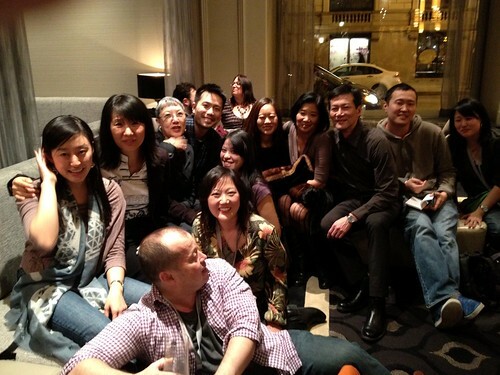 It was like finding a lone Korean American writer wolf and adopting her into our pack. I always thought being a Korean American was like being a unicorn, so this gathering of unicorns? Amazing. Chicago taxis that take credit cards? They’re total unicorns. I can’t think of any segue for unicorns. I went to panels. There were 10,000 conference attendees, and at times, it felt like waiting in line for a Disneyland ride. Some of the panels were advertised as readings and turned into amazing craft talks. And vice versa. I’ll be quoting from some of these panels for years to come. 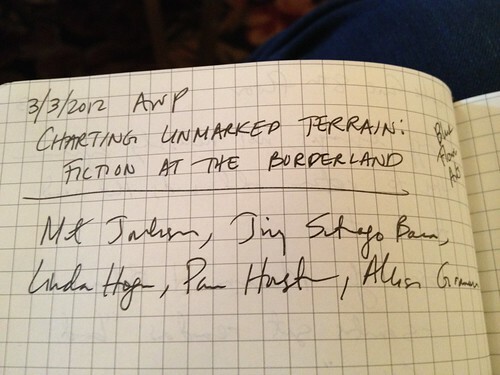 I mistakenly told my friends I’d be taking meticulous notes at the AWP panels. I became the “designated panel attendee” while my friends went off to socialize (“Send me your notes!”). I had so much fun. I haven’t had this kind of fun (the exhausting, no sleep, socializing to the max, letting go of my social inhibitions and opening myself up to new people kind of fun) in ages. I met new people. And made new friends. And I met good friends I’ve known online for the first time irl. Good times, good times. And then I came home and had a bloody mary. To fend off post-AWP-hangover. I’d never had a bloody mary to treat a hangover before. It really works! I’m off to AWP in Chicago! This is my second AWP in five years; the first time I went was not too long after my stroke. I dragged my recovering brain to one panel a day and then slept the rest of the day in my hotel room. I don’t even remember the panels I attended, because I was so brain damaged the information either never got into my brain or they’re lost in that weird black hole. I remember John Irving’s keynote speech–how he said he writes the last chapters of his novels, first. And how that got me unstuck in my own novel, because months and months and a year later, I tried writing the last chapter of my novel, and that helped unfurl the entire narrative of that first draft. This is my first AWP with my entire brain. 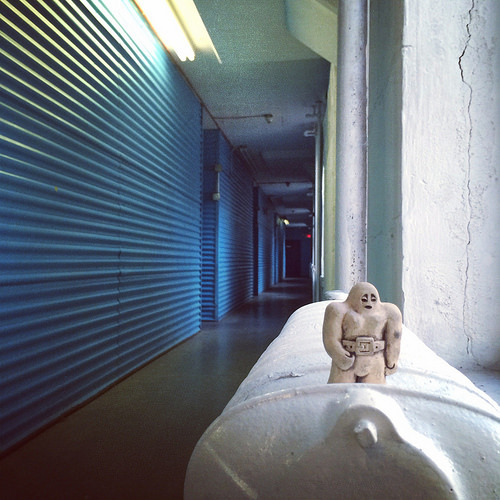 I’m no longer an MFA student, but I am looking forward to mindshare on the writing process and writing life. I’m looking forward to a few more irl connections, and a number of panels per day. I’m also petrified of being exhausted and overwhelmed, so my backup plan is to stay in my hotel room in the fetal position. 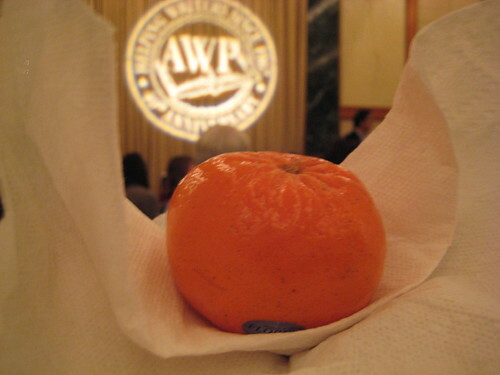 The twitterverse is bustling with AWP anxiety and travel updates. 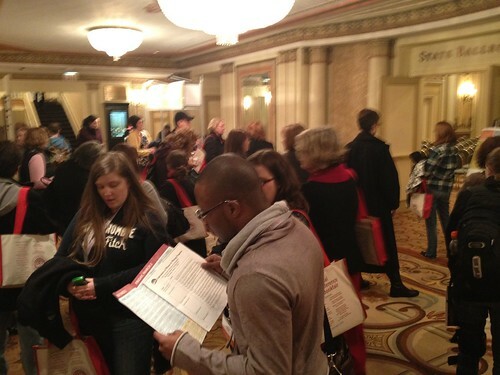 Writers are converging upon Chicago! I travel so much that this will be my second trip to the airport in three days. And by the time I return home, I’ll have been at an airport three times in seven days.